New technique detects cells hiding dormant HIV reservoirs, wakes virus up. HIV is a viral infection that is treatable using Antiretroviral Therapy (ART). ART stops HIV from replicating itself and by doing so reduces the amount of virus in the blood stream to such low levels that it prevents the virus from being passed on, and allows the body and immune system to recover to normal. However, ART alone cannot cure HIV. This is because ART only works on HIV infected cells which are active, whereas most cells infected with HIV in the human body have dormant or sleeping virus. 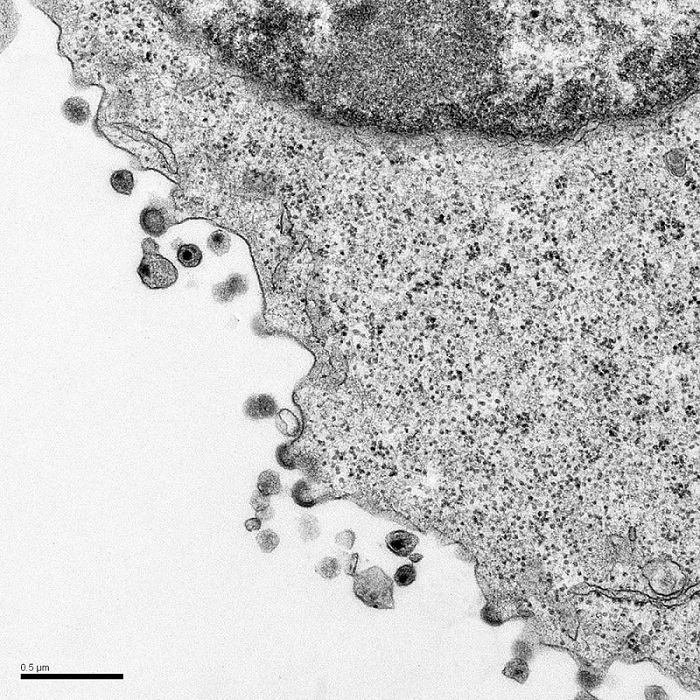 These cells represent an invisible reservoir of HIV, and are one of the reasons it is so difficult to cure the infection. Now, a study from researchers at the University of Montreal develops a technique for detecting the cells that hide the dormant virus and prevent current therapies from curing HIV infection; they successfully woke up the virus to find the rare cells that were hiding it at very low numbers, a limit of one cell in a million. The team state that this is an unprecedented level of accuracy, which opens the door to individualized monitoring of HIV-positive patients and could facilitate the development of personalized treatments. The opensource study is published in the journal Cell Host & Microbe. Previous studies show that HIV reservoirs are cells and tissues in which the virus persists despite ART. The virus predominantly lives and replicates in a particular type of white blood cell, CD4+ T lymphocytes. While antiretroviral drugs are generally successful in controlling the viral load in infected individuals, preventing the progression to acquired immunodeficiency syndrome (AIDS), some viruses remain hidden for years and can be reactivated if patients stop their treatment. To develop new, targeted treatments to eliminate these residual infected cells, researchers need to know exactly where in the CD4 T lymphocyte population the virus hides. The current study uncovers these HIV hiding places, identifying and quantifying the cells containing the dormant HIV to test drugs. The current study develops an innovative technique for detecting HIV reservoirs, namely, a way of taking a photo of each individual cell hiding the virus, an approach that is 1,000 times more accurate than current technologies. The group analyzed the blood of 30 patients infected with HIV, both before patients started treatment and after they received ART. The team state that they were able to detect the virus in CD4+ T lymphocytes in almost all of the patients analyzed. Results show that once the HIV hiding places are found, the virus can be eliminated in two stages. The lab explain that the HIV is woken up from its dormant state in the cells, where it then becomes visible to the immune system or drugs which can eliminate it. Data findings show that two drugs, bryostatin and a derivative of ingenol, wake up different populations of CD4+ T lymphocytes, thus waking up different reservoirs. The team surmise that they have successfully used simultaneous detection of viral protein and mRNA to identify and phenotype dormant, reservoired HIV in ART treated patients. For the future, the researchers state that before arriving at a potential treatment for humans, they are planning to evaluate the effectiveness of new drugs to awaken similar virus reservoirs in monkeys to determine where the virus is hidden. They conclude that if the drugs are well tolerated, clinical trials will begin in a few years.